NYC color | preciousandmakeup.org || it's just a beauty thing. I’ve gotten a lot of questions of what my make up routine was like. This is just the basic routine(varies when it comes to eye make up & lipcolors). Takes me at least 20-30 mins to do a full face look (again,the time varies). I apologize for any grammar or spelling errors I might have made,I did this late at night. 1 ) First,I start off by using Clear.Now Acne System before putting any make up. I use to use Proactiv before I started using this.Proactiv worked & then,it started to stop working.When I finally stopped using it,it made my face horrible (& that’s an understatement). Clear.Now is more milder than Proactiv & doesn’t dry out my face. Sometimes I skip using the ance treatment lotion that’s apart of the system & use Jason Natural Cosmetics Revitalizing Moisturizing Creme 5000 iu Vitamin e. This stuff is wonderful!It leaves your face nice & soft. I put this on before(I usually wait at least 10mins to soak into my skin) I apply my foundation & my face doesn’t get greasy/oily because the lotion. 2 ) I tend to interchange between these two foundations I’ll be mentioning. Revlon Colorstay Foundation for combo/oily skin in Toast is a great drugstore foundation if you don’t feel like splurging on an expensive brand. When I use this foundation,I have minmal shine & it doesn’t feel like I’m wearing anything on my face.Some days I wear Artistry Absolute Oil Control Foundation in Control Hazlenut. This foundation is pricier than Revlon but it’s totally worth it. I have no shine on my face throughout the day & a little bit of this foundation goes a long way. It also doesn’t disappear during the day like other foundations do. I apply my foundations with a make up sponge.I don’t fool with foundation brushes despite what other people say. Make up sponges give me a more flawless coverage.I put a little foundation on my sponge & then,I dot it on my forehead,cheeks,chin & nose. Instead of rubbing the sponge on my face,I make a dabbing motion.I also put a little foundation on my neck avoid the embrassing the mix match color neck & face look. 3 ) After applying my liquid foundation,I always set it with Artistry Loose Powder in Dark. This powder is lightweight,doesn’t give much color & doesn’t make me look ashy. The powder sets your foundation throughout the day,minimizes shine & eliminates foundation meltdowns. I use either a large powder brush or a kabuki brush. I pour a little bit of powder on the lid,swirl my brush in the powder,tap off the excess on the lid & then,I make a light buffering motion on my face. 4 ) Sometimes I do my eyebrows after my eye make up but lately,I’ve been doing them before.I use NYC Cosmetics Browser Brush Brow Kit in Brunette on my brows. This is kit is so cheap but,it works great.It comes with everything you need. Eyebrow color,grooming wax,angled brush & tweezers. I usually tweeze my eyebrows after I shower because my skin is more supple & I find that it’s “painful” during the tweezing process. You don’t want to go overboard tweezing,just tweeze the little stray hairs. I dab the angled brush in the wax first & then into the eyebrow color. I apply it on the thicker part of my eyebrows. 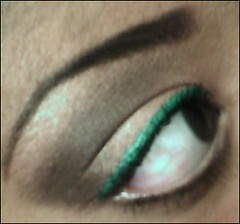 Then,I use a thin eyeliner brush & then,dip it in the wax/eyebrow color for the “tail end” of my eyebrows. 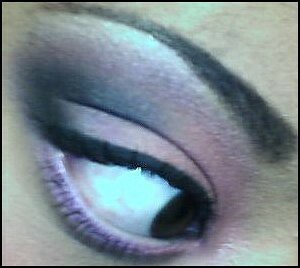 5 ) Before putting any eye color on my lids,I ALWAYS apply an eyeshadow base/primer. I use Urban Decay Primer Potion & this product prevents creasing,prolongs the wear of your eyeshadow and,makes the color(s) stand out. Depending on what color eyeshadows I’m wearing,sometimes I use Urban Decay Cream Eyeshadows as a base. I usually wear a cream eyeshadow near the same shade as the powder eyeshadow I’m wearing that day. What this does is intensifies the color of the powder eyeshadow and makes the color really pop. 6 ) When I’m on the go & have no time to do crazy colorful looks,I settle for smokey netural looks. They go with every outfit & are very simple looks. I start out by applying Flirt! Cosmetics Eyeshadow in French Toast (shimmer beige/tan color) with a medium eyeshadow brush on my lid right up to my crease. To prevent eyeshadow “fallout”,apply eyeshadow in a patting motion instead of sweeping it on your lid. It’s best to get a little bit of eyeshadow on the brush at a time. You build up intensity after every application. 7 ) I take a large eyeshadow brush & dab it in MAC Cosmetics Eyeshadow in Unsquare (limited edition-in Patternmaker 6 Warm Eyes Palatte;Velet Brown). I apply this color in my crease & blend it up all the way up to my browbone. To blend,I make a “windshield” motion. By adding this brown to the crease,it gives more depth & dimension to the look. 8 ) For more added depth & an instant smokey effect,I then apply Artistry Eyeshadow in Jet (being replaced with Black Tie eyeshadow;Matte Black) with a small eyeshadow brush in the outter crease (blended well). This eyeshadow is my FAVORITE black eyeshadow. It’s long lasting & it’s matte so there aren’t any shimmer/sparkles to it. This eyeshadow works great as an eyeliner (using a thin eyeliner brush dampen with water). 9 ) To finish of the eyeshadow part of the look,I apply a highlight color. I apply MAC Cosmetics Eyeshadow in Shroom (golden beige) to my browbone. A highlight color really finishes off a look. 10 ) Eyeliner & mascara really finishes off an eye look. For eyeliner,I either use MAC Cosmetics Fluidline (eyeliner and/or can be used as an eyeshadow base) in Blacktrack (black) or Sephora Eyeliners(variety of colors). I also use other brands of eyeliner as well.MAC’s fluidline is a creamy liner that is in a pot & you apply it with an eyeliner brush or an angled brush. I use a thin eyeliner brush when apply fluidline on my top lid. For my waterline,I dip a black eyeliner pencil in the pot & then,apply it to my waterline. What this does is darken up the black & really makes the liner last. 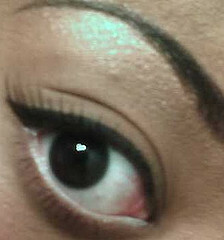 11 ) Lastly,I use Artistry Definitive Lash Mascara in Extreme Black for my eyelashes. I have literally no lashes but with this mascara one swipe of this & it makes as tho I’m wearing fake eyelashes. It’s very important to swipe down the sides of the brush on the side of the mascara tube. This will prevent clump lashes. When applying mascara,I make a wiggling motion & start at the root of my lashes working the wand up. 12 ) I use to never wear anything on my cheeks now,I have to always have a little bit of color on them. My favorite cheek product currently is Artistry All-Over Bronzer in Bronze Lustre. Not only can you use it on your face,it doubles an eyeshadow color.Perfect amount of color & shimmer. I use a blush brush when apply the bronzer. I start at the apples of my cheeks working my way up to my temples. I always apply my bronzer/blush on angle.It really does give an contouring effect on your face. 13 ) If bronzer on the cheek wasn’t enough,I apply MAC Cosmetics Blush in FAB (limited edition) or Slave To Love (discontinued) only on the apples of my cheeks. It gives it a little more color without over doing it. MAC blushes are good because they are very long lasting & the color doesn’t fade during the day. 14 ) If you need it,contouring can be your best friend. I personally think I need a little contouring on my face. I use Sunset Duo Blush & Bronzer in Sunset Strip(only the bronzer side) for contouring. I apply bronzer with an angled brush on the sides of my jaw. What this does is create a more depth,shadow & slimming look. When using a bronzer for anything contouring etc,make sure the color is at least 2 shades darker than your natural skintone. 15 ) Before applying any lipcolor on my lips,I put Sephora Professionel Most Complete Lip Balm or Rosebud Salve Lipbalm. It smooths the lips out before applying any color & if I wear a sticky/thick lipgloss that day,it thins it out. 16 ) I have different varieties of lipglosses & lipsticks but,lately I’ve been wearing MAC Cosmetics Lipgelee Lipgloss in Jellicious (deep plum).Unlike MAC’s lipglasses,the lipgelees aren’t sticky at all & just glides on. They don’t make my lips peel or chapped,it feels great on the lips. You are currently browsing the archives for the NYC color category.